Bigland: "As of right now, things are stable in Windsor and Brampton." DETROIT — Fiat Chrysler Canada CEO Reid Bigland said the automaker remains committed to its two Ontario assembly plants, even as he acknowledged headwinds in the passenger car and minivan segments. “As of right now, things are stable in Windsor and Brampton,” he said. 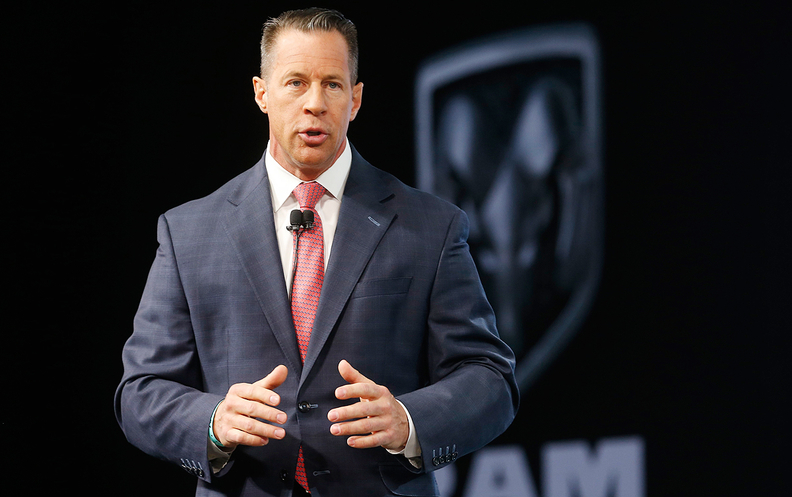 Bigland, speaking with reporters at the Detroit auto show following the reveal of the 2019 Ram Heavy Duty pickups, conceded that there were segment-wide sales headwinds facing the vehicles built at the factories. The Windsor plant builds the Chrysler Pacifica and Dodge Grand Caravan minivans, while the Brampton factory assembles the Chrysler 300, Dodge Challenger and Dodge Charger. Sales of each FCA vehicle assembled in Canada in 2019, with the exception of the Charger (up 1.2 per cent year-over-year), dipped from 2018. Grand Caravan sales plummeted by 31 per cent to 32,253 units, Challenger sales fell 34 per cent to 2,274 units and Pacifica sales slid three per cent to 5,999 units. Sales in the United States, however, were a mixed bag, as Grand Caravan, Pacifica and Challenger sales rose and 300 and Charger sales declined. A shrinking North American car market and uncertainty over the plant’s long-term product mandate have fuelled questions about the future of the Brampton plant in particular. While the Charger and Challenger remain profitable for FCA, it was not expected that redesigned models would move to the automaker’s Giorgio platform that underpins much of its future product plans. That could limit which vehicles, such as a high-margin Jeep vehicle, FCA can build at the plant. Bigland said the automaker remains dedicated to Brampton. “We’ve been committed to Brampton for a long time, and we’re not looking to waver on our commitment to Brampton,” he said. Bigland’s comments came about a week after General Motors rejected proposals by Unifor to keep production running at its Oshawa, Ont., assembly plant beyond 2019. The decision sparked a major showdown between GM and the union, and it has renewed discussion about the long-term viability of Canadian auto manufacturing. Industry analysts Automotive News Canada spoke with following the Oshawa announcement said most other Canadian assembly plants appeared to be in healthy shape for the forseeable future, as they build products vital to each automaker. The exception was FCA’s Brampton plant due to those long-term product questions. FCA invested $325 million in Brampton’s paint shop in 2018, while it pumped $1 billion into the Windsor plant in 2016 to make it the automaker’s minivan production hub. FCA employs about 3,500 workers at Brampton on two shifts and 6,000 hourly workers on three shifts at Windsor.